President Muhammadu Buhari has sought urgent measures by leaders of the Lake Chad Basin Commission states to halt the resurgence in attacks by Boko Haram. 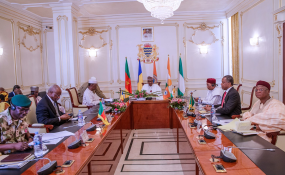 It was a renewed call to arms in N'djamena, capital of the Republic of Chad, on Thursday, as President Muhammadu Buhari held a one-day consultation with Heads of State and Governments of the Lake Chad Basin Commission (LCBC). "As you are aware and have witnessed in recent times, there are new developments of security concern in our sub-region. The region in the recent past has witnessed increasing attacks, particularly on military formations by elements of the Boko Haram terrorists as well as the renewed kidnapping of people. These activities are aimed at weakening our collective resolve to eradicate them from the region. "We must not cave in. The group's renewed strategy of increasingly mining the general area as well as its recent deployment of Unmanned Aerial Vehicles (UAVs) for surveillance activities have proved to be critical factors in the resurgence of attacks in the region." Commending what he called the "untiring efforts" of the leadership of the LCBC, and officers and men of the Multi-National Joint Task Force (MNJTF), President Buhari noted that the efforts of those who strive to bring peace and stability to the region would never be forgotten. "We are committed to ensuring that the ideals of restoring peace, stability and viability of the Lake Chad Region to its glorious state, for which some of you have paid the ultimate price is attained," he vowed. President Buhari in a statement by his spokesperson , Femi Adesina, submitted that "We must not relent and allow the enemies of the region to succeed in their quest to destabilize the area. We must reinvigorate our collective will and commitment towards eradicating terrorism from our region. "We must remain focused and true to ensuring sustainable development. To this end, I have requested that bilateral and multilateral platforms of engagements by member countries affected by the conflict be revamped to ensure collective actions towards stamping out the remnants of the terrorists from the region. "There is no gainsaying that also fueling the crisis are the twin menaces of poverty and the continued shrinkage of the Lake Chad, which have rendered the people of the region vulnerable to terrorist activities. Attention is drawn to the Lake and its resources, which have always been the source of livelihood for the millions of people that live within and around the basin." Mr Buhari stressed that if meticulously pursued, the project "has the capacity to unlock the economic potentials and provide solutions to the myriad of interrelated challenges confronting the region." He reiterated an earlier promise he made to troops fighting terrorism: "We are committed to ensuring you have the requisite and enabling equipment to optimally function. Your welfare is, and would continue to remain our priority. Together, we shall restore the Lake Chad Region to its glorious days."